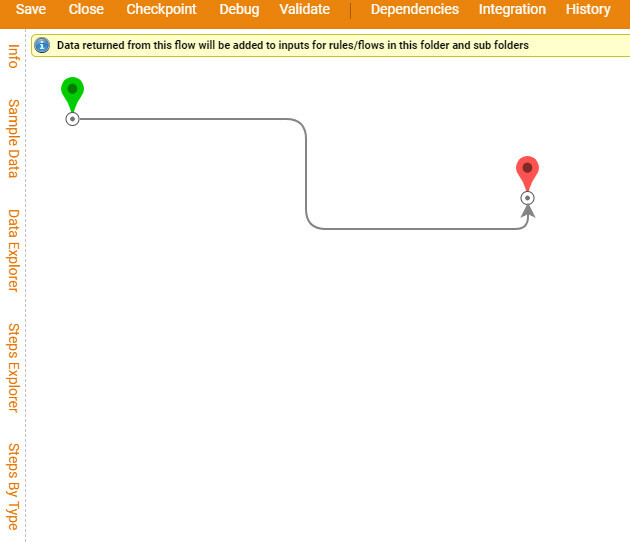 In order to use Rule Sets and Interceptor Rules , Decisions.FlowSets Module should be installed. To learn how to install Module in Decisions please click here	. This tutorial demonstrates how to create and use Conditional Rule Sets	in Decisions . 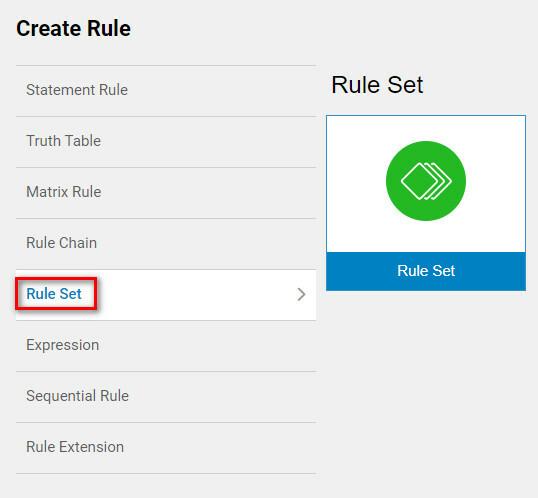 Conditional Rules provide the ability to create Rule Sets	within aRule Set	. A Conditional Rule Set may evaluate conditions to determine if this Rule Set needs to be executed. In addition, a Conditional Rule Set may Extend Rule Set	input data. In this example, begin by creating a simple Rule Set. Then create a Conditional Rule Set	within this Rule Set. The Conditional Rule Set will define the conditions which will determine whether or not to run the Rule Set and extend input data for this Rule Set . 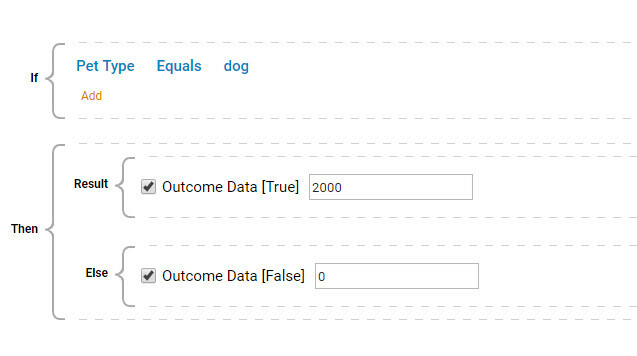 Finally, we are going to create a simple Workflow to test ourConditional Rule Set. Begin in the designer Folder by selecting Create Rule	located on the Folder Action Panel and then select Rule Set. Name	Rule Set and select Create	to save and continue. In the Rule Set Folder	, selectSetup Rule Set	in Folder actions panel located across the bottom of the Rule settings editor. In the Setup Rule Set	designer, under Inputs select Add New	and name the Rule Set Input,(Pet Type, String)	. Under Setup select Scoring	as your Usage type, also under Rule Set Type	choose Conditional	. Now Save and close the Setup Rule Set editor. 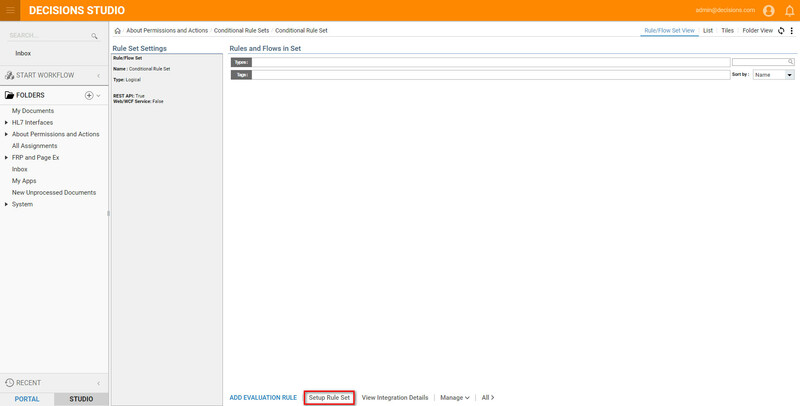 In the Rule Set Folder	choose Create Rule Set [Conditional]	on the Folder actions panel. Name	the Rule Set and select Create	to continue. 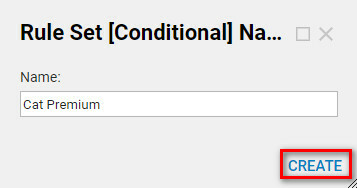 For this example create two Rule Set	conditions. Set up the Rule, if the Pet Type equals Cat,	the premium will be 1000. Set up the Rule, if the Pet Type Equals Dog	the premium will be 1000. 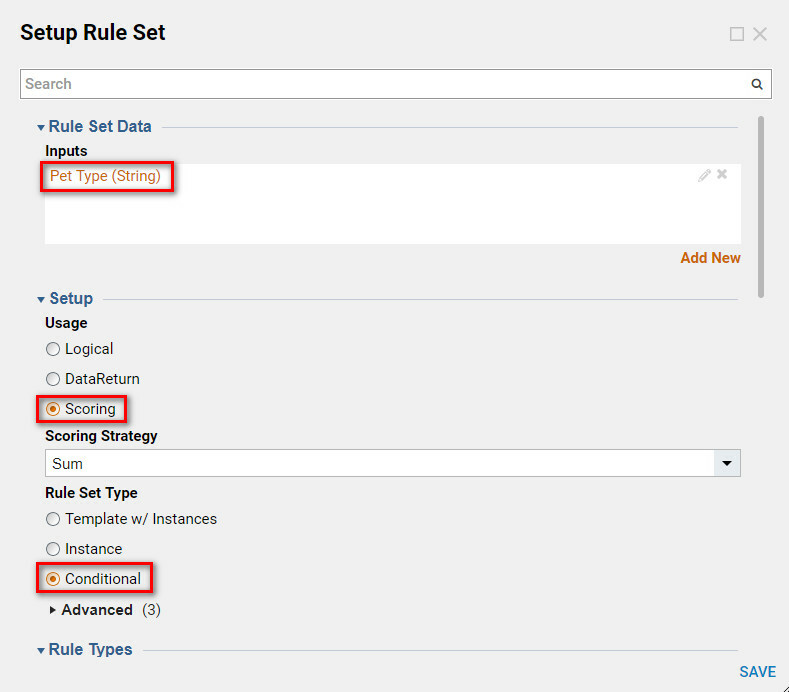 After the Rule set is set up a Conditional Rule	is automatically set up as a result as well as a Data Extension Flow. 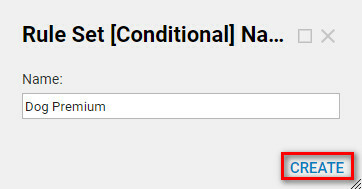 Navigate to the designer Folder under the Pet Premium Rule, select Conditional Rule Set	. The Conditional Rule Set	Folder opens with a Rule	and a Flow	is created in the Set . In the Run Set Rule	define the conditions to run this Rule Set. Edit the Data Extension Flow	to extend Input data	for this Rule Set. Edit	the Run Set Rule. In the Rule designer, if this Rule returns ‘True’ , the Conditional Rule Set	will run. Choose Pet Type	In list dog, Cat. The Conditional Rule	will check to see if the animal is either a dog or a cat and then determine whether to even run the Rule Set. In this example the animal must be either a dog or cat or the Rule Set will not run. 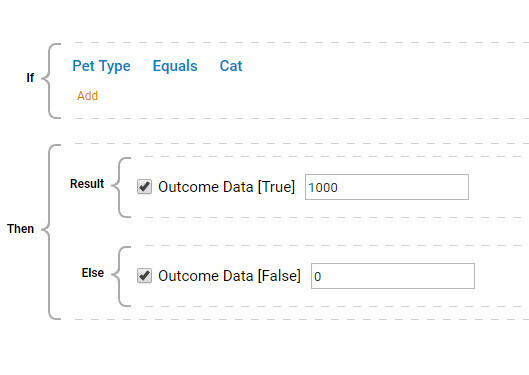 A Data Extension Flow can be used to add Feilds to the defined Input of the Rule Set. This completes the example for Conditional Rule Sets	. Connect the done pathway to the end step anddebug	the flow to check the flow data.